I graduated that year and didn't know him for very long — although my crew often frequented the bowling lanes run by his PBA star father, Billy Hardwick — but recently got back in touch after reading one of his articles in Wired. 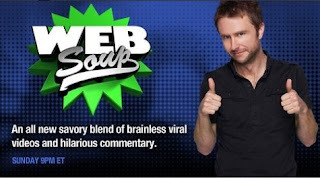 As you may have heard on this morning's Bob & Tom Show, he's got a new show on the G4 network this weekend, Web Soup — an internet-focused version of the E! Network's Talk Soup, premiering Sunday at 9 p.m. EDT. Be sure to tune in! Update: Well, that's surreal — the first time I ever mention the Hardwick bowling lanes online, I get word that part of the plaza it's in burned down last night! Sounds like the Hardwick place was untouched, and nobody was hurt.